Do you have synthetic grass questions about how to install turf, how safe fake lawn is for kids, or how long our grass lasts? Those are just a few of the things we want you to know. This FAQ has what you need to learn to shop smart as you look at faux grass. Find out how to get what’s right for your yard, and how to place it and care for it well. Read on for artificial turf facts about faux grass, how it works, how to use it, and what we do to help you get the best deal. With our full range of 60+ types of fake grass plus top tools and accessories, we are there for you at every step of the way as you choose, install, and care for your new lawn. 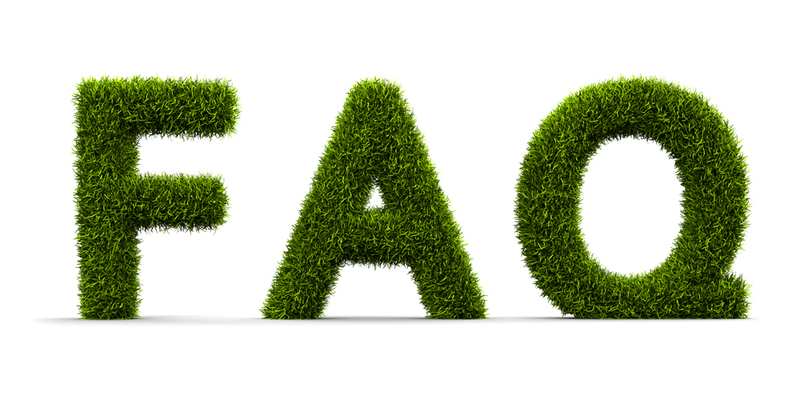 This FAQ is just the start of what our staff can help you with, and we are glad to give you the artificial turf facts you need to make the smart call for your yard. When you know the answers to these synthetic grass questions, you will be all set to choose a turf that’s right for you! Get the rundown on our range of products, and on the top-notch customer service, we offer. Our free delivery, our warranties, and our discounts for contractors are just a few of the ways we add value for folks in the SF Bay Area who come to us. Check out this FAQ to get to know faux grass, and you’ll see why WatersaversTurf is the best place to shop for all your fake lawn needs. Do you know what can make or break your fake grass lawn? Any pro knows, when you install a fake lawn, each choice you make in how you lay it out will set the look of your turf for the whole life of the yard. No detail is too small. Even which way the blades face is a big deal, and can change the whole feel of your lawn.Check out our artificial turf installation tips to start things off right from day one. Learn how to lay infill, how to prep your ground as the base, and more. We will even tell you one of the ways that a golf putting green is not the same as any other type of faux lawn. It is not hard to learn how to prep and lay turf, but you will need to know to stretch, seam, and protect your faux grass. Do you know what to do with gopher wire, or how a cold day might change the way your turf turns out? There are a lot of Do’s for how to put in a fake lawn, and even a few Don’ts, so read up! We are here to help it all make sense. Our FAQ is packed with artificial turf installation tips to give you a yard that looks neat and smooth for years to come. Our FAQ is full of the things our clients ask the most. Of course, no two yards are just the same, so you may have a question that we haven’t heard yet. If the lawn facts that you need to know did not pop up for you here on this page, we are glad to help you find out what you want to know! Contact Watersavers Turf with any of your synthetic grass questions. Come stop by one of our SF Bay Area stores, or call us on the phone at 844-974-8873, and we will be glad to talk with you. If you got the facts you need, but the one thing that’s left on your mind after you’ve had a look at this FAQ is “What will my new faux lawn cost?” then you can get a free quote from us right now. How does your free delivery work? Contractors: We offer free next day delivery with no minimum order. Homeowners: We offer free next day delivery on a minimum order of 300 sq. ft.
20 – 25 years under normal usage. Where is your Turf made? The raw materials are manufactured here in the USA. It is assembled in China. We are unique because most companies do the opposite. Their raw materials come from China and then are assembled here. The way we do it keeps costs down and ensures a safer product for our customers. What Turf do you carry? Our WatersaversTurf brand is manufactured by Global Synthetic Turf. We carry a variety of green colors and blends: Olive, Spring, Emerald, Sierra, Evergreen, and Lime. We also have black turf. What is your Turf made of? Our backing consists of layers of polyurethane (PU) and glue. The majority of products on today’s market are made with PU backing, as it is theoretically more advanced. PU is a chemical based glue so it doesn’t react to moistures. However, PU will react more to temperature changes, and it can shrink/expand. Our blades are made of polyethylene (PE) – or plastic. It is soft and durable, as well as being nonporous and easy to clean. Our thatch is made of polypropylene (PP) – another form of plastic which is harder and more durable. Nonporous and easy to clean. Yes! Our products are LEAD FREE and are safe for adults, children and pets. Do I get a Certificate of Warranty? Yes, a Certificate of Warranty is available upon request. How quickly does Turf drain? 30 gallons per square yard per minute – faster than natural lawn! What kind of maintenance does Turf require? We recommend you clean it every 8 months: hose it down, blow the leaves, power broom. Yes! It is made of plastic, with small parts glue. Can you do the layout design? We can assist with layout design for larger jobs. Are there different types of blades? C Blade = Has a high wear tolerance and an ideal durability to withstand heavy-traffic areas. This blade allows a perfect “stand on” look most synthetic turf fails to achieve. As a part of our performance series, C-shaped blades allows grass to stand up straighter under significant pressure. S Blade = There is no shine. While flat blades reflect the entire spectrum of light making grass appear white, the S-shape helps to diffuse reflectance, texture and color. Stemgrass Blade = The blades are wider than diamond or flat blades, making it one of most popular blade designs for its realistic look and feel. This blade design is recommended for residential and commercial lawns with medium traffic. U Blade = Blades stand upright under pressure, making it perfect for high traffic areas. Soft to touch, reliable and durable. Great for commercial landscaping primarily due to its high wear and tear tolerance. W Blade = Comes with Cool Max Technology. The blade is designed to reflect sunlight and retain moisture, which keeps it 15 – 20 degrees cooler than other turfs. Double W Blade = The three veins of the blades create a realistic look – to such a degree that the human eye cannot see the difference between a natural and artificial lawn. The wavy surface of each blade diffuses sunlight, which both reduces the possibility of an unnatural, plastic appearance AND carries away more heat energy which prevents lawns from overheating. Durability is another advantage – it is highly durable under constant pressure, which makes it great for high-traffic areas. Can I get samples of your product? Contractors: We offer 1′ x 1′ samples of our turf. We want you to be able to take the turf samples to your clients so they can touch and feel the turf, and have the chance to pick the right color. We can mail you samples whenever you are low, or you can stop into one of our 6 store locations. Homeowners: We offer 1′ x 1′ samples of our turf. You can stop into one of our 6 store locations, or we can mail you samples for $15 to cover shipping costs. What size does the tape come in? The Ultrabond seaming tape comes in 1’ wide and we can cut it to any length you need! Can the standard seaming tape be used with glue? It is OK to put seaming glue on the standard seaming tape. However, we still recommend you use 4-6inch nails and stagger them along the seam for a secure seam. What seaming method do you recommend? We recommend using our Ultrabond Seaming Glue (comes in 3 sizes: 28 oz. tube, 1 gallon and 5 gallon), and our Ultrabond Seaming Tape. It is designed for sports fields and the bond will hold under rough wear and tear. If you choose to use the standard seaming tape, we recommend you use 4-6inch nails and stagger them along the seam for a secure seam. The EasySeam Machine is also a great alternative. It is easy to use and adheres immediately. It is ideal for medium – low traffic areas. How long does it take for the seam to dry? With the EasySeam Machine, it dries within 5 minutes and you can finish your installation! How long does it take for the seaming glue (Roberts Indoor / Outdoor Carpet Adhesive) to dry? It takes 24 hours to dry. Even with the nails in place to secure the seam, you want to give it the 24 hours to dry before carpet kicking it / stretching it. Otherwise it will pucker at the seam in between the nails. What size bender board do you carry? What size gopher wire do you carry? What size weed fabric do you carry? How many nails are in a box? For our 5” turf nails, there are approx. 500 nails in a box (50 lb box). For our 6” spiral shank turf nails, there are approx. 600 nails in a box (50 lb box). SILICA (sand): Silica sand is the most economical way of infill. This product is a natural infill that is non-toxic, and it can be used in conjunction with many other infills on the market. ZEOFILL: Organic, natural and environmentally safe. ZeoFill is designed to eliminate odors from pets. Traps and controls odors and quickly absorbs moisture. GREEN SAND: Kiln dried sand, coated with Arch Biocide (an anti-bacterial) and green in color. It is an environmentally friendly, premium infill material, and is less abrasive than natural sand. How much infill should I use? Are there different infill amounts, etc. in regards to Putting Turf? YES! Putting Turf differs widely in both the amount of infill used and the installation process itself. Seaming area = make sure to use finishing nails! Putting greens have NO surface or perimeter nails. What is the best direction to install Turf in? You need to ensure the stitching on the back matches up along the LENGTH (not along the width of the Turf). What is the best way to stretch the Turf? You want to stretch the seam from the inside, working your way out. Seam together starting on the inside, and carpet kick the seam out to the edges / bender board. This will allow for a smoother application. How to create proper drainage? The area cannot be flat! When creating the base, be sure to create a slight grade for drainage. What is the best way to compact the base rocks? The best way is to use a compactor machine (we do not sell). However, another option is to use a long roller (we do carry). How smooth does the decomposed granite surface need to be? As smooth as possible! Otherwise your Turf will not lay flat. You do not want to rush this layer. Do you recommend gopher wire and/or weed barrier? YES! A gopher cannot get through the turf BUT they can create tunnels, making the turf uneven. As for weeds, they can grow through the turf. So, you definitely want to help reduce that with weed fabric. Do not install Turf around windows! If you install Turf near windows (even up to 30 feet), the Turf will burn and the warranty is void. To prevent this from happening, the windows need to have a protective film coating or screens need to be installed. Do not install Turf in cold weather! You need sun in order to install Turf. You want to lay out the Turf in the sun 1 – 2 hours before installation (backing up) so it is stretched and flexible, making it easier to work with.